The goal of Medicare Supplement Plan L and every Medicare supplemental insurance plan is to extend the benefits of Original Medicare in order to reduce unexpected out-of-pocket expenses, such as copays, deductibles, and coinsurance. The Plan L has lower costs by you taking some out-of-pocket costs. For personal consultation call us 844-528-8688 or compare rates on this page. Continue reading for details on the Medicare Supplement Plan L.
While most Medigap plans pay 100% of the charges for covered services, Medicare Supplement Plan L is a little bit different in that it only covers 75%, leaving the remaining quarter of the expenses to be paid by you. This difference is seen only in Plans L and K, which also both feature a maximum dollar amount that you can pay in a given year. Read our Medigap L guide to learn a little bit more about this rather unique option among Medicare supplement plans. Plan L pays for 100% of the Medicare Part A coinsurance and hospital costs (up to 365 additional days beyond typical Medicare benefits). The other covered services, however, leave you with one-fourth of the bill. Plans L and K offer a maximum out-of-pocket expense limit in order to protect you from excessively high medical costs. In essence, these limits make up for the cost sharing by preventing you from being bankrupt by an emergency. In any given year, once you have reached the spending limit, you will not be billed for any other covered services. You’ll still have to pay your monthly premiums, though. For Plan L, the out-of-pocket limit for 2018 is $2,620. Who Is Medicare Supplement Plan L Best For? Unlike most other Medigap plans, L does not leave you completely free from out-of-pocket expenses for covered services. This means that when you have a sick appointment, you’ll need to pay coinsurance or a copay. If you need blood, you’ll have to share the cost. With that in mind, Medicare Supplement Plan L is not ideal for anyone who is uncomfortable paying expenses as they come up. If you want your healthcare budget to remain very predictable, you are better off with a plan that offers 100% coverage of the services you’ll use. That being said, Plan L does come with lower premiums than most other plans, and the out-of-pocket maximum ensures that you’ll never be financially burdened by sudden emergencies. So Plan L could be a great choice for you if you are just looking to use Medigap as a safety net and don’t think you’ll be making too much use of the services that are only partially covered. At first glance at a comparison table, it’s hard to imagine why anyone would choose Plan K over Plan L. They cover the exact same services, except K only pays 50% compared to Plan L’s 75%. 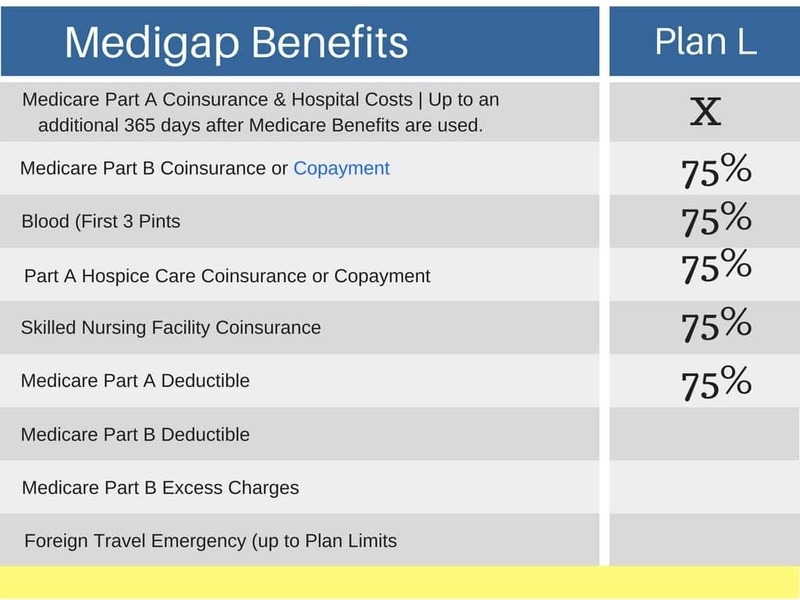 Furthermore, the maximum expense limit on Medigap K is twice that of L.
So why on earth would anyone choose Plan K? Well, most comparison charts don’t include the monthly premium because this varies so much from one insurance provider to the next, and can even change based on the condition of the recipient. But, on average, Plan L costs about $90 more per month than Plan K.
Wondering if the Medicare Supplement Plan L Is Right For You? Plan L isn’t historically one of the most popular plans, but that doesn’t mean that it isn’t the right plan for you. When it comes to choosing the appropriate Medigap policy, there is no one-size-fits-all plan. The right plan is the one that meets your needs and fits in your budget, and we can help you figure out exactly the best Medicare supplement for you. Reach out through our simple contact form or give us a call today at 844-528-8688. We’re ready to help.